Summary of today’s show: Say the letters CYO to a Catholic from Boston, and they will inevitably recall the glory days of CYO athletics when hundreds of parish and parochial school sports teams competed in several sports across the Archdiocese. 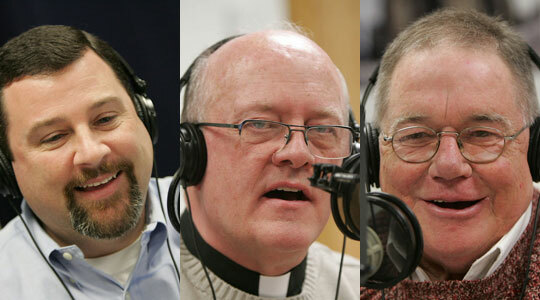 Peter Williams, Stephen Colella, and Fr. Frank Silva join Scot Landry to say that those glory days aren’t just in the past. The annual CYO March Madness tournament is beginning and will bring 87 out of 368 teams in 11 different divisions together to be crowned the best in basketball in eastern Massachusetts. But it’s not just another recreational league. Catholic athletics teaches virtues and Catholic values in an environment that helps young people to grow in faith and integrity. 1st segment: Scot said CYO Athletics is not just about the final score… It’s about positive coaching, sportsmanship for children and their parents, learning to live together in a diverse community, maximizing talents, and fostering the physical, intellectual, emotional and spiritual strength in each of us. The programs are representative of the Christian values of respect, love, compassion and support for each other. Through sports, competition and teamwork, CYO athletics provides healthy growth and development through games, practices and the life lessons that sports teach. Scot said the Archdiocese has a version of March Madness in the CYO basketball tournament. Pete Williams is the CYO athletics director and Fr. Frank is the chaplain for CYO athletics. Stephen Colella is the assistant director of Office for the New Evangelization of Youth and Young Adults, of which CYO is part. Peter said in 1963 he was appointed deanery athletic coordinator in Dorchester and since 1977 has been athletic director for CYO for the Archdiocese. Scot said CYO athletics was huge in Lowell in the early 80s when he was participating. Peter said in the 1950 and 1960s, every parish had a CYO program. Right now, there are still 350 teams in the Archdiocese. Peter said when he was a kid the parish was the hub of the community and most kids wanted to participate in the CYO. It was a time when young people were readily coming forth to be part of the Church. Fr. Frank said during his high school years CYO was known not just for athletics, but also social, spiritual and cultural programs. CYO was an opportunity for leadership development for young people. CYO councils were elected in parishes and on the deanery/vicariate level they had youth councils and then an Archdiocesan youth council. Fr. Frank served as an officer in his parish CYO and a deanery officer in the Lowell area and then served on the Archdiocesan council. He was an appointed member. Each council had committees for religious, social, athletic, and cultural activities. At the archdiocesan council level, he was appointed to the sports committee even though he’d never been involved in athletics. Peter said he was a classmate in the seminary with Fr. Frank along with Fr. Bill Schmidt, who was the chairman of the archdiocesan youth council that Fr. Frank served on. Fr. Frank said his decision to enter the seminary was affected by involvement in CYO. Those were the glory years of CYO, he said. National conventions for CYOs took place every other year and would draw five or six thousand young people from around the country. Stephen talked about growing up in Wayland and being involved in soccer and how that influenced his development as a person. He said CYO athletics ties together the natural virtues to the supernatural virtues. As you become a teammate you grow out of yourself. When you baptize sports, you realize what a powerful influence you can have on who young people can become. Scot said growing up CYO for him was just sports. Peter said the goal of CYO sports is to connect sports to the spiritual. Fr. Matt as director of Office for the New Evangelization of Youth and Young Adults has done more to connect those, by for example, having a Mass for the opening of the sports year at the cathedral. Fr. Silva said growing up in the 1960s, there were still many community connections in neighborhoods and during high school, having a youth organization that was parish based created multiple opportunities to draw young people in through a variety of activities. He recalled CYO sponsoring an oratorical contest where people were invited to give speeches that culminated an oratorical contest at Boston College for the whole archdiocese. He said the Archdiocese was one of the first in the country to accept Search retreat weekends for high schools, which had many great fruits. Teen Encounter Christ programs also had a link with Search and CYO. Whatever else parish CYO programs offered, they all seemed to have athletics: golf, swimming, tennis, basketball, baseball. As we entered the 1970s, it began to change because of the culture and as youth ministry became the new model. Scot asked Peter what changed. Peter said when Msgr. John Carroll wrote his memoirs, he wrote that over 1,300 young people entered religious life out of the Archdiocese of Boston CYO program. The CYO program evolved over time and the upheaval of the Sixties and Seventies led to much of the demise of youth programs. Fr. Frank pointed out it wasn’t just youth programs and it wasn’t just in the Church. Peter said the athletic program has remained fairly constant and in recent time has seen a rebirth and new growth in the Archdiocese. Scot asked if it’s just sports-crazy Boston or is it nationally that CYO has become athletics focused. Peter said every diocese in New England has a very vibrant CYO athletic program. Scot asked Stephen what stands out for CYO in its effectiveness. Stephen said the Catechism speaks of the value of CYO and encourages us to be involved. The anchor for CYO has always been an outreach program to bring young people into orbit around their parish. Its in our nature to want to be in these socialized settings. Even though the culture has offered substitutes, these programs remain strong. Though there may have been a heyday and a lull, we’re rediscovering the value of this socialization and how powerful it can be for a new evangelization. CYO has some Velcro hooks that other ministries are missing. 2nd segment: Scot asked Peter about the March Madness tournament and the different levels and brackets. Peter said there are 11 divisions: 5th and 6th grade boys and girls, school and parish divisions; 7th & 8th grade boys and girls; junior boys; senior boys; senior girls. The grammar school divisions are the largest and the South Shore Parochial School League is the biggest one of all. Of the parish leagues, the Norwood-Westwood area league is growing large as well. These are parishes that don’t have Catholic grammar schools have parish league teams, although some parishes offer both. Peter said Gate of Heaven in South Boston has been a large force in CYO over the years, both boys and girls. Our Lady’s in Lynnfield is another program, and St. Margaret Mary in Westwood. St. Mary’s in Franklin field 14 teams. Fr. Frank said for this age level, while they are receiving proper religious education and growing in other ways, they are also seeing how being involved in a church activity can be fun. Peter said the priests are key and he sees the kids flock to their priests and pastors. Scot asked if the parishes travel well, sending more than just parents of the teams. Peter said it’s mostly family related, grandparents, aunts and uncles. Scot asked how the Archdiocese celebrates the teams in the March Madness tournament. Stephen said they build on the socialization idea and avenues of growing virtue. It’s powerful to give witness that is implicit and explicit. The priest coming by to see the teams. The credibility of a teacher or priest goes through the roof when you enter their world. That opens the door to their receptivity to the Church. Once that avenue is primed, then you add prayer before the game and all the other elements. The teams that take advantage of that really begin to grow a huge ministry apart from sports. Scot said he presumes that the trash talking you see on playgrounds doesn’t take place on the CYO courts. Fr. Frank said it is different, but the kids are still kids. However, the adults take a stricter line on such activity with technical fouls and if it continues coaches and priests getting involved. Fr. Frank said there have been teams eliminated from tournaments because they didn’t live up to the values being promoted. Peter said the Archdiocese has participated an online course for Catholic coaches that all coaches must take. He said we are blessed by the men and women passing on these values and virtues. Stephen said national statistics shows that young people who get involved in athletics tend to avoid trouble and get themselves on a different path. Peter said during the season, to qualify for post-season play, that a team be successful in at least 70 percent of their games and from that about 30 percent of the teams end up participating. This year 87 teams are taking part out of 368 teams total. Peter said the tournament is single elimination. It is highly competitive with large crowds coming to the games. Stephen said Milton High School is where they traditionally hold the tournament. They have a very large facility. They used to hold the tournament at Catholic Memorial for about 25 years. Fr. Silva said the younger the competitors, the more inspiring and entertaining it is to watch. Stephen said as the tournament goes on the level of play becomes incredible. He also offered thanks to the volunteers who get involved, including referees and coaches. Our prize this week is the book, Made for More by Curtis Martin. This week’s benefactor card raffle winner is Fr. James DiPerri, from Waltham, MA. Congratulations, Fr. DiPerri! Fr. Frank said what has competed with the development of CYO teams in many parishes is the development of city and town youth leagues. He said the CYO name does continue in many places with teams not affiliated with the Church continuing to use CYO. People have identified some teams as a CYO team for so long they continue to use the name. CYO has become ingrained within the psyche. Stephen said that will help CYO in the future. When you view it as ministry, you start to see what Pope John Paul said about the potential for the Church of the intersection with the culture. This is an important piece of who we are. The towns have copied a lot of what we did well. Now we need to find what new things we can do (for example, ultimate frisbee) and what things we can re-infuse with more catechesis for the future. Boston has had a rich history that will carry us forward in the new evangelization. There are so many CYO alumni who are very successful people in business and society and professional sports. Peter said we as a Church have a very difference product to offer. We’re not just a recreational league. Otherwise the Church shouldn’t be involved in athletics. We have a distinctive spiritual component to our athletics. Stephen said Catholic athletics is the Theology of the Body lived out in the body-soul union.